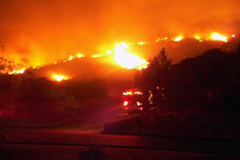 June 21, 2013 (San Diego)—Six years after the Witch Creek/Guejito fires, which the California Public Utilities Commission found were caused by SDG&E’s lines, over 2,000 victims have reached settlements with SDG&E. But 16 victims have not settled or received any compensation from the utility for their losses. Now a judge has ruled that some cases may proceed to trial. At a court hearing on June 19, Judge Richard E. L. Strauss ruled that victims will finally have their day in court—in some cases, with a tort liability, all-issues trial. 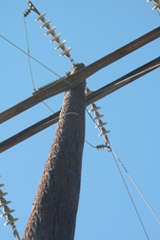 That could force SDG&E to pay punitive damages if a jury finds the utility was negligent and knew of fire hazards that it failed to correct. Judge Strauss has set a date for the all-issues trial to finally settle the remaining cases of the Witch Creek/ Rice and Guejito Fires of 2007. These were among the most destructive fires in San Diego history. February 2, 2009 (San Diego's East County)--San Diego Gas & Electric Company has notified attorneys representing fire victims that the utility company plans to sue victims of the 2007 wildfires. The announcement has sparked an angry response from some elected officials and residents in burned-out areas of East County.